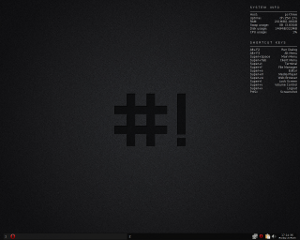 Distro Name: CrunchBang Linux or, short: #! "CrunchBang Linux is not recommended for anyone needing a stable system or anyone who is not comfortable running into occasional, even frequent breakage. CrunchBang Linux could possibly make your computer go CRUNCH! BANG! Therefore CrunchBang Linux comes with ABSOLUTELY NO WARRANTY, to the extent permitted by applicable law. CrunchBang Linux is an unofficial version of Debian GNU/Linux. Debian is a registered trademark of Software in the Public Interest, Inc. CrunchBang Linux is not affiliated with SPI." #! is fast, clear, lightweight, lean and with a desktop-environment like OpenBox the best way to dive deep into Linux and to learn the core stuff of Linux. I am quite new to Linux. Currently, I am running Ubuntu 10.10 on an old Presario. The only issue that I have had is one of support for a wireless USB adapter. However, a friend gave me a Belkin Wireless G adapter. Since then, I have not had any issues. 1) Without installing, run Ubuntu from the CD. This allows you to see any hardware issues that you may have before doing an install. If there are too many issues, you might consider another flavor of Linux. Or at least, you will have a chance to research any conflicts or issues before you begin the install. 2) If and when a person chooses to do an install, it makes the process super easy if the system can connect to the Internet. I am blessed that I have not had any real issues that I could not repair. And believe me, I am not a guru, by any means. Pros: Easy to understand, as Ubuntu/Xubuntu is so similar to windows that any noob can use it. Love the fact that Ubuntu software center is there, no clue what I would do without it. Cons: None so far. As time goes on, I hope none come up. I have the Xubuntu 10.04 LTS and the thing I like about it most is that I can run it on alot of computers that I come into contact with, especially the ancients. I have an older HP desktop that it works pretty well on. Hoping to sell it on Craigslist. For me, it comes down to one thing, basically: package management. To me, everything else doesn't matter (b/c at the core it is mainly the Linux kernel and the GNU utilities) - as long as you're willing to spend the time to customize and learn. If you have a favorite app/desktop/widget/whatever, you can probably get it onto your Linux OS somehow - hopefully easily, but that is the real trick. I know that this philosophy doesn't work for n00bs, but that's okay, i'm just saying why it works for me. N00bs need an OS that "just works" and lots of people here can make good suggestions. What I mean by package management is: how do you install some app, say ethereal? Do I have multiple ways to install it? (from one or more command line tools, from a GUI, etc.). Is it easy to query the package to get information about it? How do I check for package dependencies? Can I add a repository of software from some other (trusted) source? I cut my teeth on Red Hat (and thus the RPM/Yum package system) in the beginning, and naturally migrated to CentOS and Fedora. I have not tried many other non-RPM-based Linux OSs, but I was impressed by Ubuntu's totally different but equally efficient package system. but in the end, yum install firefox, apt-get install firefox - whatev. I also do a lot of my own packaging of software for RPM-based systems, and I'm very happy with the tools provided by the RPM developer suite - they are rather extensive and quite sufficient enough for my purposes. This part confuses me, "Pos: Stability" "Con:Limited Stability" please elaborate. Which review are you referencing? In the very begining, ubuntu. In that case I has two different classifications, the true stability is when you use ubuntu as an end user and try not to modify anything to low level. However if you are a perfectionist like myself, always modifying the core configuration files, you will quickly find that the automatic tools and scripts can overwrite or conflict with your modifications, which can cause soem nice problems that are hard to resolve. In addition Ubuntu tends to use more beta level software such as grub2, which can cause some issues if they do not configure them perfectly or if an update blocks backward compatibility. But in the end ubuntu is has proven more stable than Fedora or openSUSE for me. Interesting, thank you for clarifying. The LTS versions are built from Debian Testing rather than Debian Unstable like the rest of the releases. The current LTS release (10.04, "Lucid Lynx") is rock-stable. The Debian Testing it was built from has since been released as "Squeeze," which is Debian Stable. It is trouble-free on many computers! On my very modest old Dell, Xubuntu 10.04 runs flawlessly and even on that old hardware it is solid, pretty, simple enough for this little autistic kid, and fast! I think Xubuntu (the Xfce variant of Ubuntu) is a well-kept secret for some reason, but it's awesome and in my opinion, lots better than it's older siblings who get all the attention, especially the flagship distro, Ubuntu. I figure I'll quit lurking and start posting. I switched to Linux from Windows, and God forbid I ever go back. I only use it when absolutely necessary. I really like Ubuntu and their mission statement. I've had no issues whatsoever with Ubuntu. Ubuntu is very stable, and fast. For me that's the biggest thing. I like a simple and responsive OS. The software center is great, it's saved me headache thus far. I'm running 11.04 but with Gnome 2. I used Unity for a short amount of time but had to switch back. So far I think Gnome 3 is great with what they've done, but I tried it and hated it. Maybe it'll grow on me? So for right now Gnome 2 is my preferred GUI. I changed majors from History to Computer Science and I've really gotten into Linux. I'm looking into Archlinux right now. I'm not overly experienced with the command line so I'm going to give it some time before I switch completely. I'm still learning so I figure it'll be gradual. There is one other Linux I would have loved to try, PCLinux Gnome...... but, its gone out of business! !